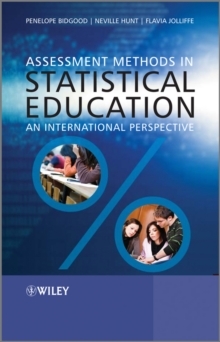 Assessment Methods in Statistical Education: An InternationalPerspective provides a modern, international perspective onassessing students of statistics in higher education. It is acollection of contributions written by some of the leading figuresin statistical education from around the world, drawing on theirpersonal teaching experience and educational research. The bookreflects the wide variety of disciplines, such as business,psychology and the health sciences, which include statisticsteaching and assessment. The authors acknowledge the increasinglyimportant role of technology in assessment, whether it be using theinternet for accessing information and data sources or usingsoftware to construct and manage individualised or onlineassessments. Key Features: * Presents successful assessment strategies, striking a balancebetween formative and summative assessment, individual and groupwork, take-away assignments and supervised tests. * Assesses statistical thinking by questioning students ability to interpret and communicate the results of theiranalysis. * Relates assessment to the real world by basing it on real datain an appropriate context. * Provides a range of individualised assessment methods,including those that deter plagiarism and collusion by providingeach student with a unique problem to solve or dataset toanalyse. This book is essential reading for anyone involved in teachingstatistics at tertiary level or interested in statistical educationresearch.